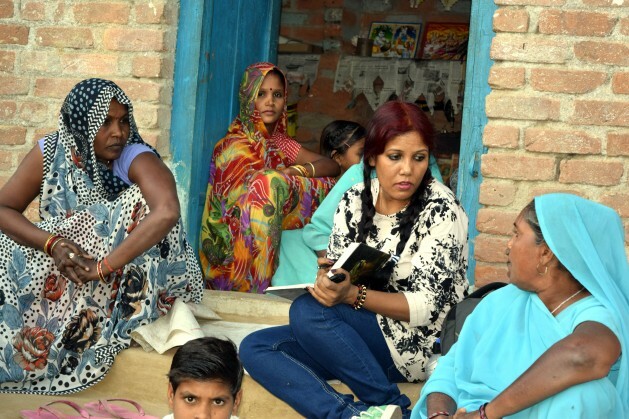 Paul interviews Dalit women in Hamirpur - a district in Northern India. All of these women have been abandoned by their husbands who fled to escape drought. Credit: Stella Paul / IPS. NEW YORK, Nov 6 2016 (IPS) - Journalist Stella Paul was midway through an interview about toilets when she found herself, and the women she was speaking to, under attack from four angry men. “This man, he comes and he just grabs this woman by her hair and he starts dragging her on the ground and kicking her at the same time,” Paul told IPS. She remembers thinking, “what is happening,” as another three men followed, beating the women, including Paul who was hit in the face. 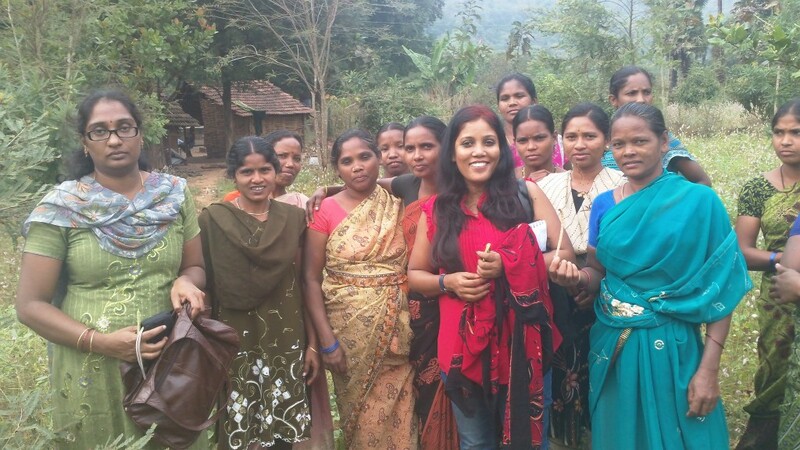 The attack took place while Paul – a 2016 recipient of the International Women’s Media Foundation Courage in Journalism Award and IPS contributor – was researching a story about women forced into dual slavery in illegal mines in South-East, India. The women Paul was interviewing had been forced to work unpaid in the mines, but were trying to escape, some of them were attending school, and they had now found out they were potentially going to have their own toilet under a government sanitation scheme. Paul, who comes from North-Eastern India, travels her home country talking to some of the poorest people in India and unearthing stories of unbelievable exploitation and corruption in places where other journalists often think not to look. She often spends her time listening to the stories of untouchables – people who other Indians don’t consider worthy of having opinions. But Paul believes that although her kind of journalism often comes with little recognition she is also constantly rewarded. “Once you start going there, meeting these people you can never become a bitter cynical skeptical person who will look down on poor people,” she says. Listening to these stories has helped her grow in empathy and become a better person, she says. Yet by listening to the disenfranchised, Paul often finds herself getting into trouble, as was the case when her interviews with the women about toilets uncovered local corruption. Paul with forest women she interviewed in Anantagiri, Inida about solar energy. Credit: Stella Paul/IPS. Yet by daring to talk about having their own toilets the women had stepped into dangerous territory. The government of India had allotted funds to the state as part of an anti-defecation drive. More than 500 million people in India, almost half of the total population, still defecate in the open. According to UNICEF open defecation is a serious threat to public health and an underlying reason why 188,000 children under five die from diarrhea every year in India. “There is a lot of money that is coming in and these men, the local government, they are actually stealing this money,” said Paul. This is why the women talking to Paul about toilets was met with violence. After getting punched again while rescuing a girl she had asked to take photos for her, Paul marched straight to the office of a senior local official. But the commissioner sat behind a transparent window clearly unoccupied while his receptionist told Paul he was too busy to see her. Paul didn’t give up, returning the next day. “We finally got to meet him, but what I wanted was not to complain about what happened to me but to interview him about … the sanitation project because I wanted to get my story first.” she said. The commissioner pretended not to understand Paul’s English or Hindi. She says that reporting on development issues like gender violence or gender inequality is difficult because a lot of people, including government officials, don’t believe these issues are important. Paul herself almost did not survive childhood because she was born a girl. When she was 2 years old, and sick with diptheria, part of her family did not see it as worth treating her, because she was a girl. She survived because her mother fought to save her. Preference for male sons has led to a ratio of 919 girls to every 1000 boys in India, according to the 2011 census. Paul has gone on to write about infanticide for IPS. Courage in journalism often focuses on reporting on war zones, but reporting on gender violence is also a form of war reporting, Chi Yvonne Leina, a journalist from Cameroon and Africa Lead at World Pulse told IPS. “Stories like what (Stella) tells – people don’t necessarily know until they dig through in the community,” said Leina. But this digging can lead to negative reactions, says Leina. Paul has received threats both anonymous and to her face that she too will be made to disappear. While reporting on brick kilns using child labour in her home state a man grabbed her phone and threw it in the river. “He said: ‘do you see that phone it didn’t take seconds to disappear in the river we make people disappear just like that,’ and then he was snapping his fingers,” Paul described. Paul is one of three 2016 recipients of the Courage in Journalism Award, alongside Janine di Giovanni, Middle East Editor of Newsweek and Mabel Cáceres Editor-in-chief of El Búho Magazine. The awards were presented at ceremonies held in New York and Los Angeles in late October. Reeyot Alemu, of Ethiopia the 2012 recipient of the award was also honoured at the ceremony – she was previously unable to attend after being jailed for 1963 days. Can she get a male partner to accompany her?